Fall is fast approaching and soon we’ll all be compelled to undertake the mother of all seasonal challenges; the change of wardrobe. Throughout this transitional, turbulent period, we’re left in limbo, going from light-weight wear to rigorous layering. Fashion crazes continue to rotate and all the while women are left in a style spin. However, one wonderful trend typically associated with spring has made its way to the fall shows, gracing the catwalks of many. Florals are back with a vengeance, in bold, bewitching forms. From feminine romanticism to artistic abstract prints, one thing is for certain, floral is here to stay. In-keeping with its season-less attributes, these three floral infused timepieces will ensure you remain in bloom. Harry Winston is known for fine jewel craftsmanship, which carries through into their watch collection. The Avenue Classic Cherry Blossom is no exception. This enchanting timepiece immerses you into the Japanese sakura. The flowering cherry blossom is beautifully emulated through the 39 brilliant-cut diamonds and 29 brilliant-cut pink sapphires present in the dial. Cut in various sizes, they portray the season’s change, some scattered among the white gold branches, with others rest on the dial floor. The diamond studded 18K white gold case measures 21x36mm, surrounding the blueish-green mother of pearl dial, its iridescent quality capturing the spring sky. Powered by Swiss-made Quartz calibre HW1044, this botanical timepiece is an elegant addition for your trans-seasonal wardrobe. The Lady 8 Flower by Jaquet Droz is the true embodiment of femininity. From its figure 8 shape with diamonds galore, to the blossoming lotus flower atop, this timepiece is as aesthetically pleasing as it is technically. Made up of two superimposed circles, creating a symbol of harmony and infinity, the lower circle, or 18K white gold dial, is graced with 353 diamonds and is surrounded by a blue sapphire encrusted bezel, whilst the top circle displays a mechanical animation in the form of a blossoming lotus flower, sat under a sapphire crystal dome. The lotus flower serenely opens up with the press of a push button, revealing its 0.24 carat diamond heart beneath the 18K white gold skeleton petals. Through meticulous workmanship, Jaquet Droz accommodated two mechanisms, the watch’s and the automaton’s, without interference between the two. A self-winding watch with 38 hour power reserve, the Lady 8 Flower makes a bold statement with its delicate details. For whimsicality on the wrist, the Richard Mille RM 19-02 Tourbillon Fleur encompasses the concept of regeneration in a poetic fashion. The timepiece is marked by the magnolia flower, resembling resilience and its long-standing existence. Its hand-crafted coloured petals of solid gold open and close every five minutes, or on demand using the pusher at 9 o’clock, uncovering the flying tourbillon underneath. When exposed, the tourbillon rises approximately 1mm, as if readying itself for pollination. The centre is set with rubies, symbolising the stamens in the magnolia flower. The RM 19-02 movement is encased in diamond-set 18K white gold. 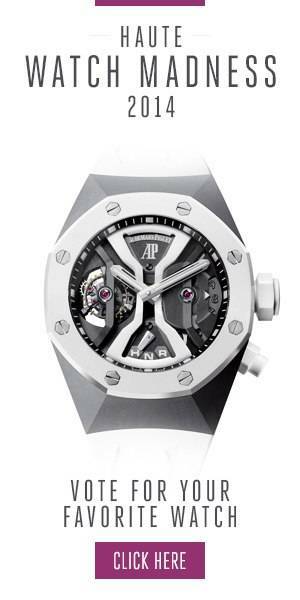 The sub-dial is also adorned with diamonds, with set stones marking the hours. Teamed with a satin or leather strap, this sophisticated timepiece from Richard Mille possesses exceptional poise and character, falling well in-line with this, and next season’s floral boom.